Our annual RNLI SOS Tea Afternoon was held in the Methven Hall in February with proceeds to the Kirkcaldy branch of the RNLI. In May we hosted a craft and art fair in the Methven Hall whilst outside it was Welly Planting Day where much welly throwing was enjoyed whilst planting continued in the garden. The garden improvements were organised by the new Community Garden Project team tasked with improving community use of the Church grounds. Also in May we hosted a Fiddlers Rally in aid of the RNLI which saw a concert by Fife Strathspey and Reel Society performed in the Church. In August the Messy Church hosted a picnic in the Beveridge Park. A new event in September was the Car Treasure Hunt in which teams drove around the local towns to find the answer to 50 clues. The hunt ended in Falkland with the winner correctly finding 49 correct answers! Our annual Fun & Find Out Day hosted local families in the garden and the halls. Volunteers served tea/coffee and managed the events. 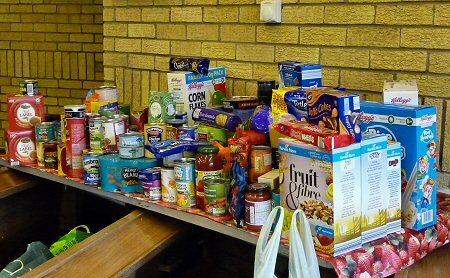 Our Harvest Sunday again collected foodstuffs for the Kirkcaldy Branch of the Salvation Army. 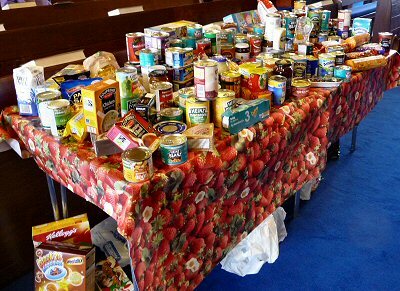 These were generous donations of harvest produce which were distributed to the needy in the district. In addition, a collection was also held for Jenny Featherstone in Zambia. 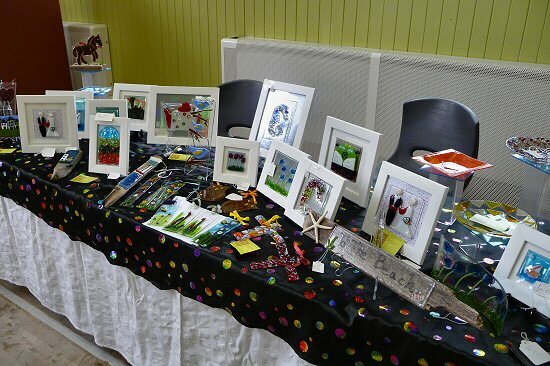 The pictures below show one of the tables of collected goods and the specially decorated Church. 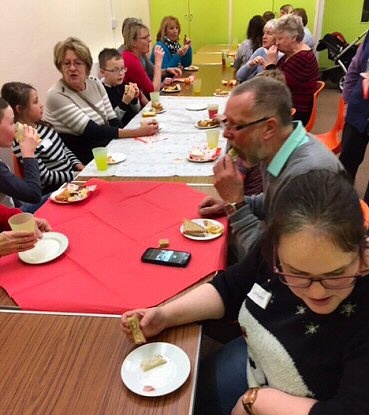 The popular Family Quiz Night, hosted by the Womens Group, encouraged lively competition and included a delicious savoury buffet supper. The Messy Church, currently held every few months, has been a great success during the year and is now hosting families with links to Abbotshall Church as well as additional families from our community. Because of this, expansion of their activities is planned as well as more regular events. A Fish Supper Concert was held in October in support of the Kirkcaldy Branch of the RNLI. During the month, Fish Supper events were held all over the country. 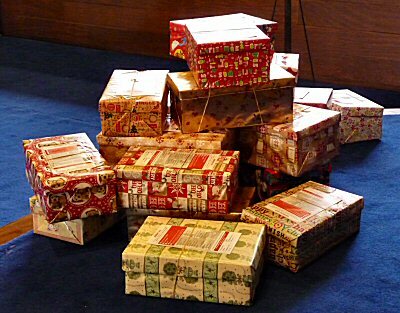 Our Christmas shoe box collection in support of the Blythswood Shoe Box Appeal was once again well supported with many boxes being sent to eastern European countries for Christmas. A special musical event, The Bennochy Winter Concert, was held in early December. 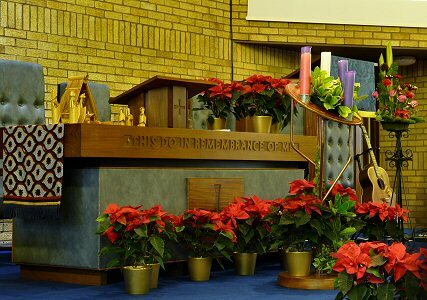 This included performances from the church choir, community choir, two singing groups from Glenrothes Amateur Musical Association, a piper, mandolin player and more. There was a raffle at the interval and the Quilting Group were selling cushions which they had been making. New for 2016 was a joint Messy Church event, the Messy Nativity, held in a vacant shop in The Mercat as a joint venture between Bennochy and Abbotshall Churches. 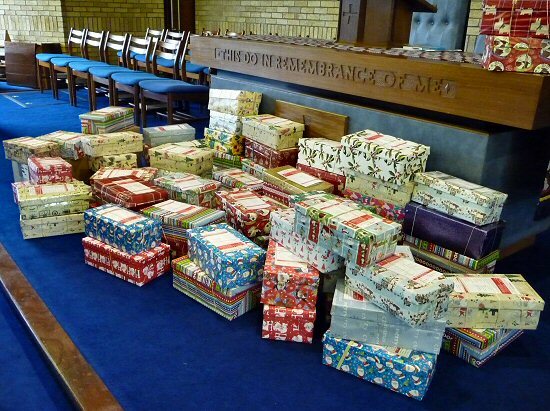 The toy gifts for the work of the Salvation Army were received in the early December service, just in time for Christmas. 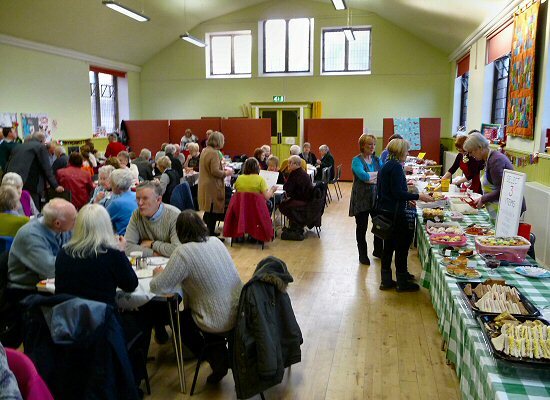 The Christmas Teas, with selected festive stalls, were again held in the Methven Hall to great success. Bruce Davies, the acclaimed singer/songwriter and congregation member, presented a concert in the Church in January. It was a Scottish themed night with 'a wee taste of Burns' and some haggis 'n' neeps which went down well! Early March was the time for the Messy Easter Celebration, as the Messy Church considered Jesus' statement of 'I AM the Resurrection'. They hunted for an elusive Easter egg, had fun with a hammer and nails, smeared paint, made things, including chocolate nests, and enjoyed other activities together before sitting down for something to eat. 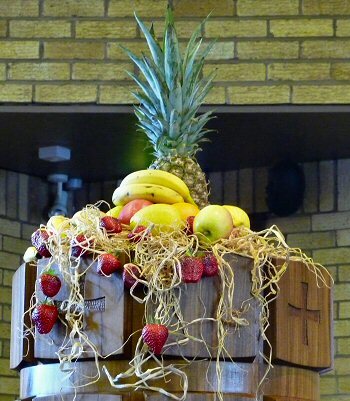 We celebrated the Word of Life in March with special signs (see below). Our Easter week rotation of Church evening services was complemented by the Summer joint services. The Women's Group Bunny Drive was well attended and hailed as a very enjoyable and successful evening. As was the annual Christian Aid Soup and Sweet Lunch. The Bennochy Community Garden Project was started in partnership with Growing Kirkcaldy. The Garden is a beautiful peaceful garden which is maintained by many unsung heroes of the congregation. In August the Garden was named as one of the charities for the Green Token Fund at ASDA in Kirkcaldy. During the Summer the constitution of Bennochy Church was changed from the present Model Deed to Unitary Deed. This change ensures that the Kirk Session deals with Spiritual and Temporal Matters and there is no Congregational Board. All Trustees are now members of the Kirk Session and current Board members elected by the congregation cease to be Trustees. In other words all elders, and only elders, will be the charity trustees for Bennochy Parish Church of Scotland. The Messy Church continued to be very popular with a joint Church event in the Mercat in August. Typically one event per month is held at certain times of the year. 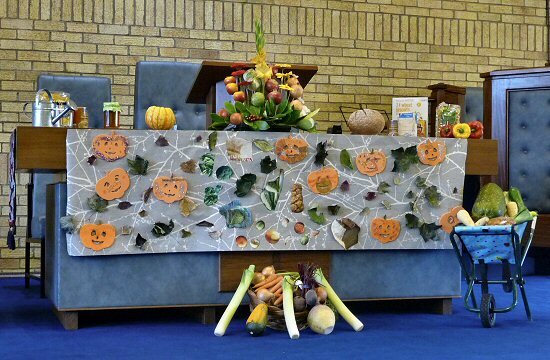 The Autumn Harvest Service saw the Church decorated with produce and a large collection for the Kirkcaldy Foodbank was received. Some pictures from the service are below. 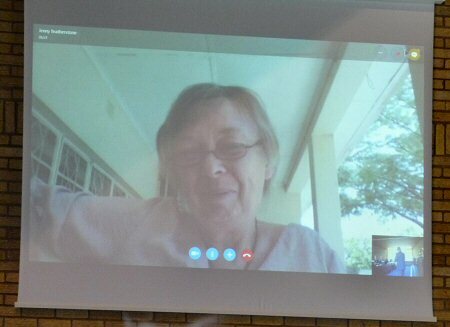 Our missionary partner, Jenny Featherstone, was live on the big screen from Zambia where she told us of life in Africa and the fundraising in progress to install kitchens in their college houses which are being built for rent. The Olive Branch Café launched a new Jigsaw Swap group with the idea is that people can donate a jigsaw and swap it with another jigsaw. The time limit of how long you take to do the jigsaw would be negotiated and only a small annual charge was levied. 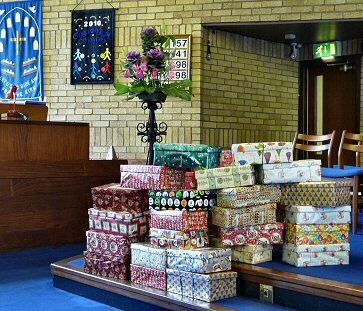 Our annual contribtion to the Blythswood Shoe Box Appeal was an excellent result with a picture of some of the filled boxes below. These were distributed in Eastern Europe and India. Community Bunting was a key project this summer with funds being raised for new lighting. 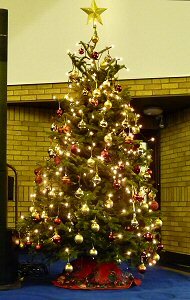 The aims were to decorate the hall, hang outdoors in summer indicating a happy event is taking place, raise funds for new sanctuary lighting and to hire to people who live in the neighbourhood for their events, weddings etc. Many chose to sew their initials on their flag. People were very creative and thoughtful, making flags in memory of someone dear to them, for their grandchildren or naming their preferred charity. 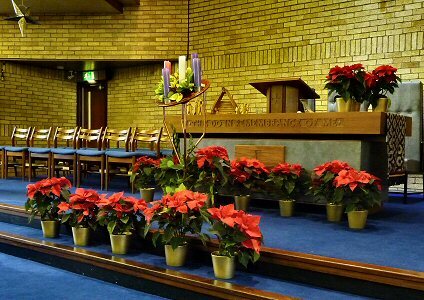 The result was a beautiful splash of colour in the church community hall. A great example of how simple efforts by many individuals come together as one successful project. In total 73 flags were sewn. Over the past 18 months, there has been a small group of volunteers, from the Bennochy Community Garden Project, who have dug and got dirty, with planting and creating an orchard, bulb and mosaic art, along with planting bulbs and wellies, all within the church grounds. There has also been a small group of volunteers, from within the congregation, who have busied themselves in all weathers, in the church garden. All the hard work, of all the volunteers and children from Dunnikier Primary school, has been recognised. At awards ceremonies, our partners – Growing Kirkcaldy, accepted certificates on behalf of Kirkcaldy. Kirkclady was awarded a Silver Gilt, for the Small City 2017, category from Britain in Bloom and a Gold award, for the Small City 2017 from Keep Scotland Beautiful. Britain in Bloom judges rated the Community Involvement throughout Kirkclady as Gold standard. This included the church garden which all our volunteers, contributed sterling hard work. 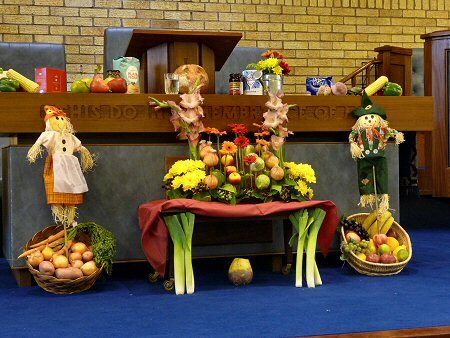 Growing Kirkcaldy has expressed their thanks to Bennochy Community Garden Project and the Volunteers maintaining the Bennochy church grounds, and stated that we should all be proud of each individual’s efforts, which have contributed to the awards. Another piece of good news concerning the Bennochy Community Garden Project, is that the project was recently awarded £200 from Asda's Green Token Fund. The monies will go towards some raised planters for our garden whilst we are still raising funds for the planters, to enable the planters to match and co-ordinate with our benches. 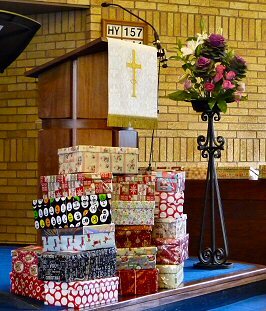 We celebrated Christmas at Messy Church on 10th December. The crafts for this session, included creating gift bags, making crackers and cards, decorating cones for the tree and decorating ice - cream cones as Christmas trees. We had activities which made us think of Acts of Kindness in the busyness leading up to our Lord's birthday. We played games of decorating someone as a Christmas tree and sooking up sweets with straws. We got into a mess as we wrapped bubble wrap around our feet, stepped in paint and stomped over an outline of a tree. Although our numbers were small, their was much hilarity and a sense of family togetherness, from the very young toddler to our more senior team members. Our celebration in the sanctuary was very moving as we heard about how difficult it would have been for Jesus' parents over 2000 years ago and tasted a chocolate orange along with singing traditional carols accompanied by Rev. McAlpine on the guitar, with only the tree lights and the spirit of Christ. We finished the session sitting down together for something to eat. You can view some photos from the Messy Christmas below. 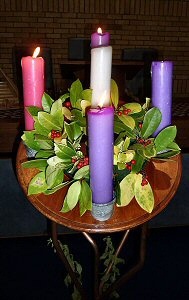 Carol: Unto us a Boy is born, played with vigour! 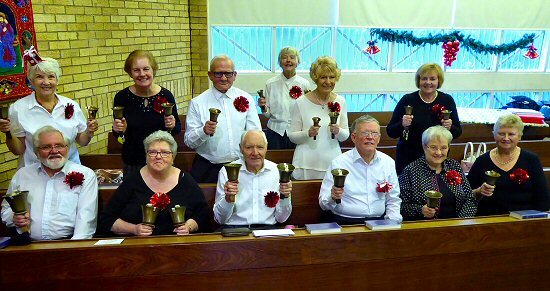 Rocking Carol: specially composed for Hand bell ringing—very gentle. The brass bells resound well in the warmth of the church and the playing much appreciated.